A Fourth Street fire displaces ten people and leads to one arrest; full coverage in this week’s issue. The Amherst-Pelham School District deals with “a firestorm of controversy” following a superintendent settlement. GMRSD officials describe the challenges caused by charter growth. 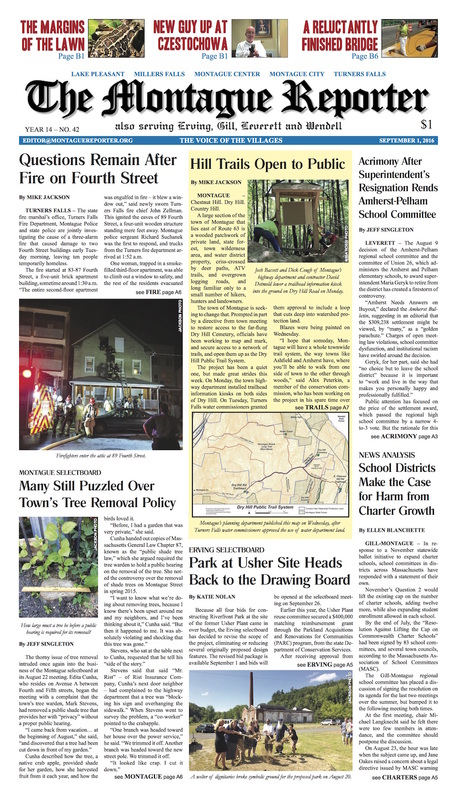 A busy week for selectboards: crabapple controversy in Montague; Erving revisits park project; Gill scores community forest matching grant; highway truck rims jacked in Leverett; and Wendell’s flag heads to Boston — and that’s not even the half of it. As Montague’s hill trails open to the public, our editor chronicles a summer day’s adventures on the Robert Frost Trail. An ex-pat friend of the Reporter family analyzes tensions in Turkey. 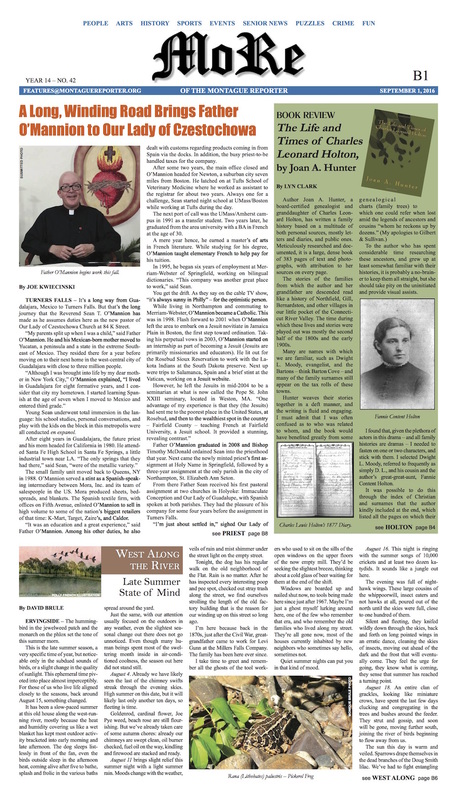 MoRe: Turners Falls is just the latest stop on the fascinating life’s journey of Our Lady of Czestochowa’s new priest. A newly published family history offers a window into the history of Northfield, Gill, and Bernardston. West Along the River is in a late summer state of mind. NatureCulture, our science page, offers a review of Brethren by Nature plus some fun science projects to try at home. We’ve got photographic coverage of re-paving and ribbon cutting on the Turners Falls-Gill Bridge. This week in television: a preview of upcoming MCTV attractions and a retrospective of 50 years of Star Trek. In Pet of the Week, sweet, skittish cat promises glimpse of double paws in exchange for quiet home. The Healthy Geezer offers up Heart Valve Surgery 101. And, the Montague and Gill police…just…well, you’ll have to read it for yourself. Summer’s over, and we’re back on our weekly publishing schedule. Don’t fall behind – grab a copy today!